The Village Walk trail is located in the Matthews/Winters Park near Denver, Colorado. From the trailhead near the junction of Highway 93 and Interstate 70 the Village Walk trail crosses the scenic Mount Vernon Creek and makes a gentle climb that takes it in the direction of Red Rocks Park. The trail is often combined with the Red Rocks trail and the Cherry Gulch and Morrison Slide trails to create longer hiking routes. The Matthews/Winters Park is the first road to the right after taking Exit 259 off of Interstate 70 onto Highway 93 as it heads toward the town of Morrison. From the parking area follow the trail that leads south toward the kiosk and restrooms. On the left there will be a small picnic area that borders the creek. The Village Walk trail continues across a footbridge that takes it over Mount Vernon Creek. From the creek the trail begins a gradual climb up the grassy slopes of the foothills. The trail builders threw a switchback in to keep the climb easy. The gradual climb continues to the trails high point after rounding the switchback. The hard packed surface is well suited to baby strollers although there are one or two rough spots. At the highest point of the trail there is a spur that leads a short distance over to the Mount Vernon Cemetery. Reverend J. R. Dean was interred at the cemetery in 1860 making it one of the first burials in Colorado. A nice short history of the Town of Mount Vernon can be found on JeffCo's website. The trail comes to an end a short distance from the cemetery at a junction with the Red Rocks trail and the Village Ride. There are some that will loop back to the parking area via the Village Ride trail but that route is supposed to be open to mountain bikes only. We are told that anyone caught hiking the Village Ride will be ticketed. 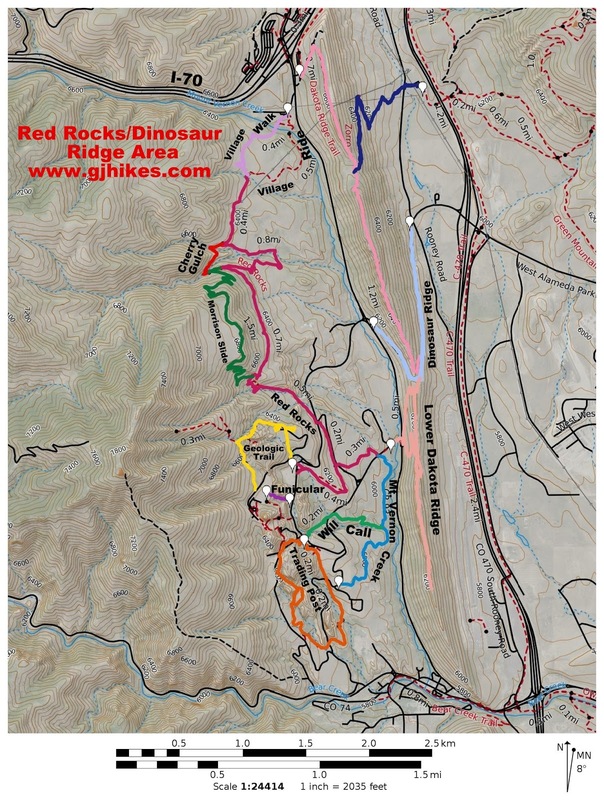 The Village Walk is an important connector for those hiking the Red Rocks, Cherry Gulch and Morrison Slide trails. 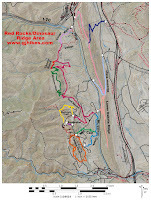 All the trails are very popular with hikers, trail runners and mountain bikers. If you would like to see it for yourself then all you have to do is 'Take a hike'.